John C. Bogle, the founder of the Vanguard Group and the father of the index fund, has died at age 89. Bogle founded Vanguard in Malvern, Penn. in 1974 and soon launched the very first index fund two years later, which tracked the S&P 500 and revolutionized investing. He once put it in a nutshell: "Don't look for the needle in the haystack. Just buy the haystack." The concept of the index mutual fund was born in Bogle’s senior thesis at Princeton, from which he graduated in 1951. While commonplace today, the index fund was nothing short of paradigm-shifting financial innovation at the time, and throughout the years Bogle’s central thesis — that you can’t guarantee beating the market, but you can guarantee beating prices — has been accepted. “In his early years, Jack was frequently mocked by the investment-management industry,” wrote Warren Buffett in his 2016 letter to shareholders. “Today, however, he has the satisfaction of knowing that he helped millions of investors realize far better returns on their savings than they otherwise would have earned. He is a hero to them and to me." Bogle’s Vanguard has amassed over $5 trillion in assets, and it’s brand is often associated with the massive flow from active to passive investing. But Bogle, who ran Vanguard as a cooperative — if you own a share, you own a piece of Vanguard — did not take the Buffett path to billions, something which Buffett himself noted. Under this structure, money that could have flowed into Bogle’s own pockets flowed instead into making investing next to free. “For decades, Jack has urged investors to invest in ultra-low-cost index funds. In his crusade, he amassed only a tiny percentage of the wealth that has typically flowed to managers who have promised their investors large rewards while delivering them nothing — or, as in our bet, less than nothing – of added value,” wrote Buffett. 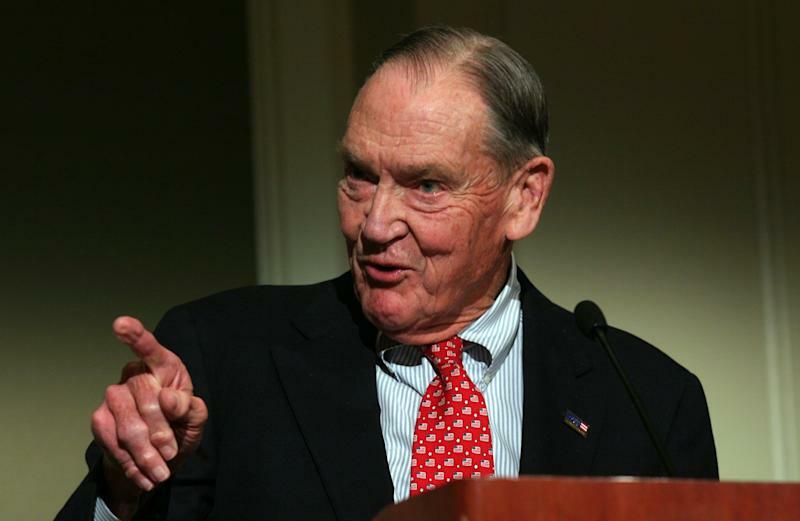 "If a statue is ever erected to honor the person who has done the most for American investors, the handsdown choice should be Jack Bogle,” he said. Bogle retired in 1996 but his fingerprints are all over the investing community. Vanguard’s Total Stock Market funds, for which he advocated sharply for in his articles and books, are the standard go-to investing picks for robo advisors, and his offerings have been copied by countless companies. Investors have poured out of active management into Bogle’s passive index funds. Buffett even wagered $1 million that an S&P 500 index fund would beat five hedge funds picked by Protégé Partners. The S&P 500 index fund, Bogle’s brainchild, won by a longshot. “Let me emphasize that there was nothing aberrational about stock-market behavior over the ten-year stretch,” Buffett noted in a letter to shareholders. Bogle frequently spoke sharply about financial managers who accepted large fees for subpar performance, making enemies along the way. One criticism often thrown at him: what if everyone ditched ditched active investing and simply bought his products? About half of equity assets today are passive instruments, a far cry from this scenario. But Bogle himself entertained the question last year, amidst the flows to his inventions.